Shaanxi construction Second Construction Group Co. Ltd. has the qualifications of first-level building engineering construction general contracting, the second-level municipal public works construction general contracting , the second-level highway construction general contracting ,the second-level water conservancy and hydropower project construction general contracting ,the first-level steel structure engineering contracting ,the first-level fire equipment facilities engineering contracting ,the first-level foundation and foundation engineering contracting ,the first-level mechanical and electrical equipment installation engineering contracting ,the first-level building decoration project specialized contracting ,the second-level garden ancient architecture engineering professional contracting . Also the company has special installation equipment qualification and the boiler installation, pressure pipeline installation licenses. And it has more than 1000 sets of equipment for all kinds of construction, transportation, test, measurement and detection . The company got the safety system certification of quality, environment and occupation health in 1999 and 2003. The group has perfect management mechanism .There are departments of production management, quality management , science and technology, operation , market development, finance ,safety skill,human resource in its head office.The company has more than 20 wholly-owned subsidiaries and branches, all of which are equipped with competent and efficient and professional management personnel.These wholly-owned subsidiaries and branches can independently undertake all kinds of construction tasks and meet the requirements of modernization, high standard, high quality, high efficiency. The group has built a quality management system that the technical chief engineer has total responsibility which has the provincial technical center, ministry of science and technology, quality department. Branches are provided with a chief engineer and technical quality department.Project departments have a technical head and full-time quality inspectors. The quality management system implements the way of vertical leadership, strictly in accordance with the ISO9001:2000 quality assurance system to organize construction and ensure the realization of project quality objectives. The group has been fighting for the national basic construction for 60 years and has made an important contribution . During the early days of our country building and "Five-Year Plan" period, the company contracted 11 projects of the national 156 key projects , and built the Baoji Petroleum Steel Pipe factory, Changling Machine factory, Lingyun Radio factory, the Northwest Power Base，Weiyang Diesel Engine factory and a number of national key electron, machinery and defense enterprises.After 1965, the country entered the period of large-scale construction and three -line construction.During this period, the company completed the construction of the Qinchuan Machine Tool factory and the Baoji Instrument factory coming from Shanghai;the Baoji Forklift factory and the Baoji Bridge factory from the northeast;the Shaanxi Automobile factory ,the Shaanxi Gear factory, the Xianfeng Machinery factory coming from Beijing and a large number of combat readiness of Qinling Mountains. Since the reform and open up,the company has took a total contract to build the largest introduced project - Shaanxi Color Picture Tube General factory, the construction of Shanghai Caohejing New Technology Development Zone, Suzhou Industrial Park, Guangzhou-Shenzhen highway, Baoji No.2 Power Plant, Xi'an postal Heavy Processing center, Cadre Institute etc. In foreign countries,the company constructed to build the official residence of the president of North Yemen, national rostrum and stadium projects; and projects in Cameroon, Botswana, Singapore, the United Arab Emirates and other countries. In recent years, the company’s high-rise building construction has a rapid development.And the company constructed to build the Baoji City branch of ICBC tower, Changling building, tax building, Xianyang Construction Bank building, Shaanxi sports culture center, provincial government Guangsha high-rise buildings, Olympic Center in Xi'an and Weinan International Trade Center, radio and television building, business building of Xi'an Branch of the Bank of communications, Shanghai Yuxing building, Shaanxi Telecom network management building . From the coast of the East Sea to the North and South of Yangtze River, these workers have created milestones with their sweat and wisdom. 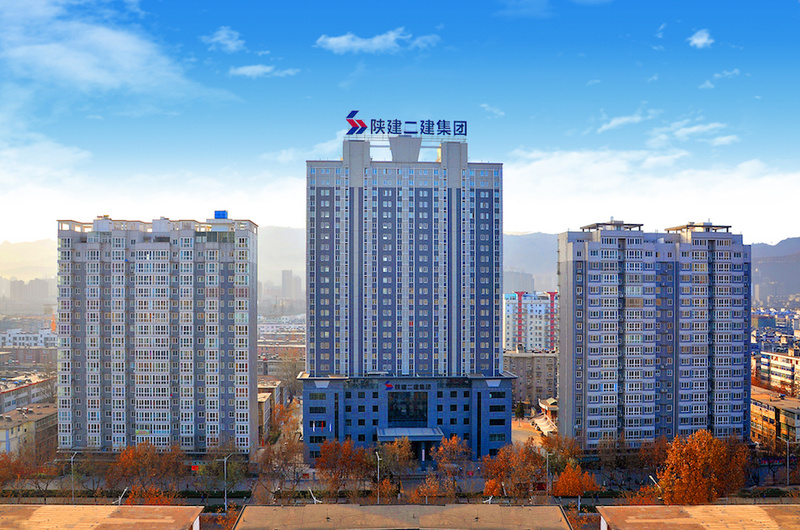 The Group continues to expand its scale and strength.In 2014 ,it contracted tasks of 7 billion yuan,and completed the output value of enterprise of 3.6 billion yuan , a contraction area of 1.41 million square meters. And it reached 86% or more excellent and good rate of engineering quality ,a 100% pass rate. The first aviation aircraft Research Institute No. 300 scientific research building and other five projects contracted by this company won the Chinese engineering highest quality award,the "Luban prize"; Xi'an Fashite Research Institute and other 4 project won the silver prize of national excellent construction; Xi'an Politics Institute high-rise residential buildings and other three buildings won the National Quality Engineering Award; the Baoji industry and trade building and other three projects won the national customer satisfaction project; Xi'an City Audit Bureau ,Chinese Yan'an cadre academy and other 30 projects obtained "Chang'an Cup" award;Shaanxi Telecom Network Management Building and other 35 projects obtained "The Yan’ta Cup" award; Xi'an cultural media industry park and other 30 projects obtained "Huashan Cup" award; the Baoji high building and other 20 projects were rated as Shaanxi Provincial science and technology demonstration projects; its 11 QC teams was rated as the national outstanding QC construction group.Witnin ten years, it created 181 provincial good sites , 149 municipal good construction sites.The Shaanxi Province telecommunication network management building and other 10 projects won the "national good construction site" title.It was named as "the top ten enterprises of creating provincial good site ".The meetings about the province and city’s good sites were often held in our city’s projects,which enjoys high reputation in our province. Shaanxi construction Second Construction Group Co. Ltd. is led by the enterprise's mission, vision, values , and always adheres to the quality policies of"people-oriented, scientific management, integrity management, build satisfactory project, create a boutique" .And it provides users with satisfactory service,and is willing to work with friends from all sectors of society for a better friendship and to seek a common development as well as contribute to society.